Rosaries, rosary bracelets and religious jewelry strung on flexwire or silk. Online shopping. Handmade rosaries, rosary chaplets, bracelets, booklets, accessories and assortment of scapulars. Includes Rosary history, Rosary prayers, novenas and scriptural meditations. Collections of rosaries and rosary bracelets, repair work. Option to specify beads, crucifix, and center online to create a custom rosary. Heirloom quality handmade rosaries, stations of the cross chaplets, St Therese sacrifice bracelets and rosary cases. Several chaplets available, as well as relic medal charms to customize your rosary. Rosaries and rosary bracelets. Specializing in gemstones and Swarovski crystals. Custom orders welcome. Ordering available online or by mail. Custom designed and handcrafted rosaries and rosary bracelets, made with Swarovski crystal and precious stones. Swarovski crystal rosary bracelets and cord Habit rosaries. Ordering online or by mail. International shipping. Prices in U.S. dollars. Your choice of crucifix, centerpiece and beads. Rosary bracelets, necklaces, and 1, 5, and 15 decade rosaries. Engraving on crucifix available. Ship to U.S., U.K. and Australia. Prices in U.S. dollars. Antique-inspired rosaries and chaplets, strung with Soft Flex wire. Crucifixes and centers cast from antique metals. Rosary parts available. Handcrafted rosaries, rosary bracelets and chaplets of glass, wood, crystal and semiprecious stones. Secure online ordering. Credit cards accepted. Dedicated to making, praying and giving away knotted twine rosaries. Sells Rosary for the Unborn and other rosaries. Order online or by mail. Handmade rosaries and chaplets. Custom orders available. Order online or by email. Non-profit organization devoted to making free rosaries to send throughout the world. Resource for Pagans interested in using prayer beads or rosaries as a part of their spritual practice. Help and resources for individuals and groups interested in making rosaries for servicemen and women overseas. Rosaries made with customers choice of semi-precious stone, crucifix, and medal. Online shopping only. Prices in U.S. dollars. Especially for those with worn rosary beads...a fresh approach to the rosary with living scripture! Handmade rosaries from miniature rosebuds. Our roses have been preserved in a polymer that keeps them strong and flexible for generations, in honor of Marys Rose Garden. North American importer of handcrafted European religious artwork, including rosaries, rosary bracelets, icons, medals, crucifixes, and oil lamps. B2B only. Online catalog, contact information. Designer rosaries & rosary jewelry created with vintage swarovski, W. Germany and Japanese porcelain, Czech and semi-precious gemstone beads. A spiritual association made up of men and women who meet on a regular basis within their own parishes to recite the Rosary either in the church or in members homes. Contains a history timeline of the Rosary as well as scripture and prayers. If the business hours of Heavenly Bound Rosaries in may vary on holidays like Valentine’s Day, Washington’s Birthday, St. Patrick’s Day, Easter, Easter eve and Mother’s day. We display standard opening hours and price ranges in our profile site. We recommend to check out heavenlybound.com for further information. 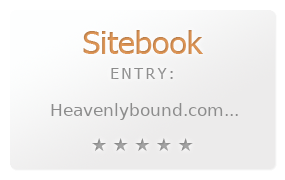 You can also search for Alternatives for heavenlybound.com on our Review Site Sitebook.org All trademarks are the property of their respective owners. If we should delete this entry, please send us a short E-Mail.